Starting Calisthenics and bodyweight training can be difficult if you have a big goal in mind, but don't really know how to get there. In this article I am going to show you a simple Strength Building Triset that will become the template for all of your bodyweight strength training - The Foundation Triset. When you are first starting out, there are a few basics that you have got to get right in order to move on to the advanced skills. This is your first goal, the benchmark, the point where you can jump off to any other skill progression. Once you master these three exercises you will have achieved a base level of strength, control and coordination you need to move forward. This isn't just recommended it is necessary. Most people in this world cant do this triset, just because I said it is the first milestone, doesn't mean that it is easy. There are progression exercises for all of these exercises and the Beginners Triset which is the easier version of this one. The Foundation Triset covers your Push and Pull movements. We don't do an Isometric however, instead we have a dynamic skill that works all of the muscles in your trunk, up to your shoulders and down to your toes. Check out the Podcast Episode where I go into detail about the Foundation Triset. Pull Ups are the Level 2 Pull Exercise, They are powerful and they are hard - at first. When you get the hang of pull ups you are pretty much sorted. Quickly you will be able to do plenty of variations, but starting out can be one of the hardest challenges you face starting bodyweight training. They work all of your back, shoulders, core, biceps and forearms, so it is worth training them! Dips are the Level 2 Push Exercise. They also come with lots of variations that will build stability and strength that you never realised you needed. You will probably find Dips are easier than Pulls, which is why they come second. People can usually do 2-3 more reps of dips because their chest and triceps are more developed than their back. Range of Motion is very important though so make sure you are going all the way down and coming all the way back up. Check out the full article on How To Do Dips here. Leg Raises are fun and will help you take your shoulder and core strength to new heights. You can do them Hanging (from the bar) or Supported (on dipping bars) and while both are good, supported leg raises are easier - so I'd make you do them hanging haha! Having said that, it may be easier to start Supported and move on to Hanging leg raises when you get stronger. Either way get as high as you can and do everything you can to avoid swinging. 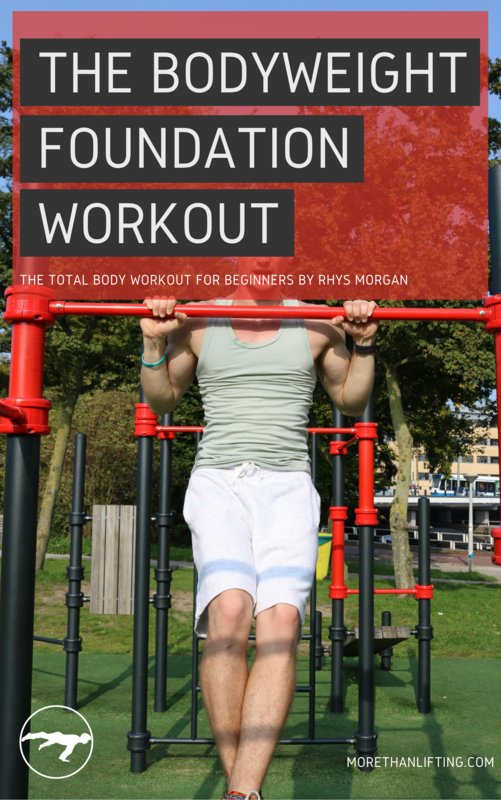 How Does The Foundation Triset Fit Into Your Workouts? Fitting the Foundation Triset into your workout is nice and easy. When you are doing strength training, do this! As you get competent you will want to make it harder, so just switch out the basic exercises for slightly more complex variations. It is also the main strength set in the Bodyweight Foundation Workout, a complete Total Body Calisthenics Workout, including Isometrics, Legs and your Warmup / Mobility Work, of course. First off get the Foundation Workout! But afterwards you will quickly want to move on to more challenging variations and different skills. There are plenty of exercise variations you can start doing immediately, but I would recommend working towards Isometric skills like L Sits and Handstands. Building towards these kills can also be daunting, I have a full article that goes in depth on Progression Templates and explains exactly How Progressive Training Works that makes it simple.